Thankfully the wait was not that long. One day later and Anoeta has fallen at last. It was more of a workmanlike than a dazzling performance by the Catalans on a fiercely cold night in the Basque Country, and it took a penalty to make the difference, but they’ll be taking a 1-0 lead into next Thursday’s second leg at the Camp Nou (9.15pm CET). For the first twenty minutes, it was Real who arguably looked the more comfortable of the two sides, creating precisely the kind of deep pressure that Luis Enrique had been so concerned about. But try as they did, Real were missing fluidity over the last few metres, and there was little in the way of real concern for Jasper Cillessen. Meanwhile, when Barça did push forward, their superior class shone through, with the tactic to take a more direct approach than usual paying great dividends. The goal finally came from the penalty spot after Aritz Elustondo had hacked Neymar Jr over in the area. There was no appealing the decision, and the Brazilian himself took the kick, making no mistake against Rulli to get Barça into the lead and also chalk up an all-important away goal. Real had no option but to up the intensity a notch or two more. One move led to a long range punt from Illarramendi that Piqué deflected wide. There was a close header from Navas. But that was about it. Thanks to some majestic operations in the Barça defence, the half concluded with very little in the way of material for the highlights reel. Barça were missing Andrés Iniesta after the break, which may have been the chief reason for the momentum clearly swinging back the way of the home side as the minutes ticked by. But Real continued to struggle to turn that momentum into anything of true.consequence. In what often felt like a rather untidy stop-start game, Neymar's magic was shining brightest of all. There were a couple of flashes of particular brilliance that he sadly couldn’t finish off. But although Barça were providing the magic, most of the main action was on the wrong end of the pitch. And yet it was rarely unnerving action, with the only moment of genuine danger coming when a Yuri strike skimmed across the face of the goal with no Real forwards on hand to follow it up. For all their efforts, Real were getting nowhere fast. Barça sprung back to life for the last quarter of an hour, with Piqué’s chance probably the best to well and truly put this tie in Catalan hands. The late onslaught was in vain and there are still another 90 minutes of this cup tie to play. 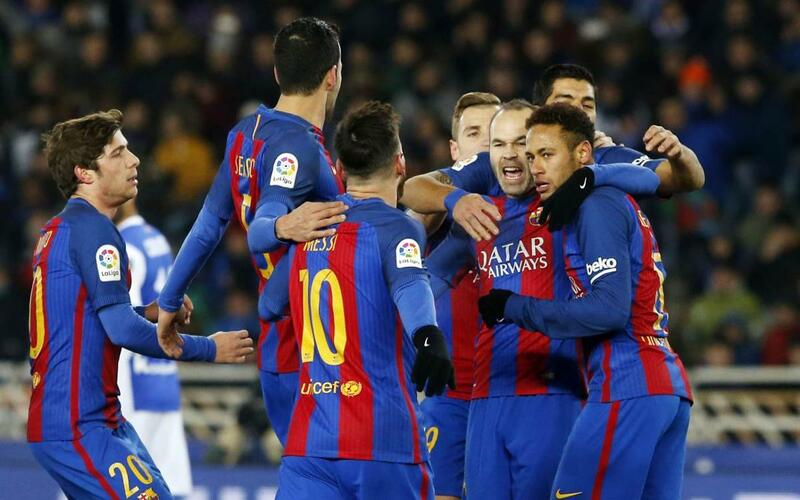 But Anoeta was always going to be the hardest part – and it's was a test that Barça managed to pass with flying colours.